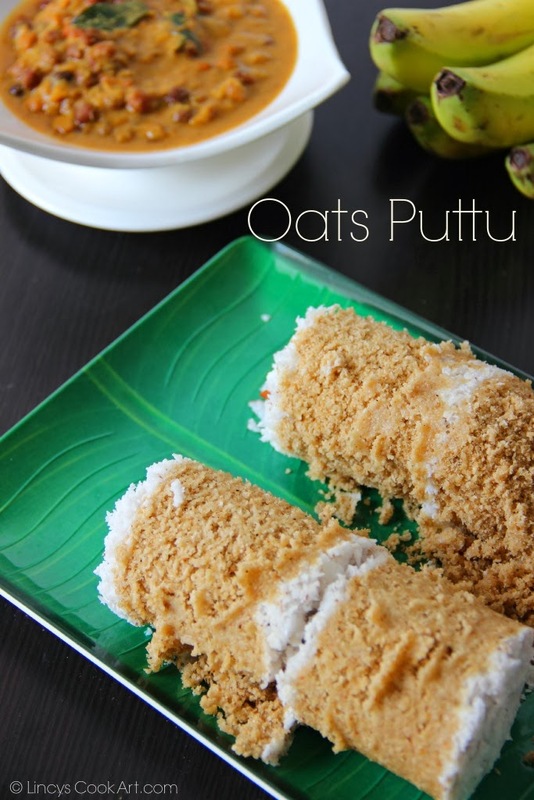 Oats puttu is a healthy version of the traditional puttu. Unlike normal rice puttu, this puttu could be prepared easily. For making rice puttu grinding rice as a fine powder and sieving in between is a tedious process. This puttu could be made in a jiffy. Easy to grind as a fine powder and tastes similar to Wheat puttu. Tastes delicious with Nadan Kadala Curry or Pazham or even with sugar. Roast the oats in a pan untill you get the roasted aroma. Powder the oats in a blender. Sprinkle some salt and water (unlike normal puttu this requires very less water) and mix well and wet the mixture. It forms some lumps also. Don't worry. Add the whole lot in to a blender and pulse for two three times. Now you get a wet sand kind of oats puttu powder without any lumps. In puttu maker/ cylinder keep the grating (Chillu), then add grated coconut, followed by two hands full of wet oats powder then again layer with grated coconut then repeat the the oats powder layer and top with coconut. Likewise fill alternatively the whole cylinder of the puttu steamer. Close the cylinder and keep on top of boiling water in side the puttu vessel, steam for 5-7 minutes till the steam comes out from the lid of the cylinder. Note: This puttu can be made with chirata puttu maker or even made inside the idli steamer by spreading on top of the white cloth too. Makes 2 cylinders (Kutti) full of puttu. You might also like this Carrot Puttu, Banana Puttu. Tasty and healthy too...... Love the clicks! An award is waiting for you on my blog , please visit & receive the award! Puttu is my favorite and this one with oats sounds delicious and the entire set up makes me so hungry. Looks perfect & healthy dish..
Oh wow wow so perfectly done puttu and a very healthy combo :) looks tempting dear !! lovely clicks ! !